Under the peal of bells, the clergy and faithful greeted the Metropolitan. The dean of St. Alexander Nevsky Diocesan Cathedral, Archpriest Serge Lukianov, greeted His Eminence and briefly expounded on the history of the church and the locally revered "Royal" Tikhvin Icon of the Mother of God. Concelebrating with Metropolitan Hilarion were: Fr. Serge, Archpriests Paul Volmensky (cleric of the Western American Diocese), Zoran Radovic (rector of St. George Serbian Church in Elizabeth, NJ), Petro Kunitsky (cleric of Holy New Martyrs of Russia Church in Brooklyn, NY), Boris Slootsky (cleric of the diocesan cathedral), Paul Ivanov (rector of Holy Myrrhbearers Church in Brooklyn, NY), and Seraphim Chemodakov (cathedral cleric), Priest Serge Ledkovsky (deputy rector of St. Vladimir Memorial Church in Jackson, NJ), Hieromonk Tikhon (Gayfudinov; abbot of Holy Protection Skete in Buena, NJ), and Protodeacons Leonid Roschko and Paul Drozdowski (cathedral clerics). Before the start of Liturgy, His Eminence awarded the orarion to cathedral altar server Roman Serebrennikov. At the Little Entrance, Fr. Seraphim Chemodakov was awarded the right to wear the palitsa. A multitude of parishioners flocked to pray at Liturgy and pay homage to their beloved Tikhvin Icon of the Mother of God. Many of them received Christ’s Holy Mysteries. At the conclusion of Liturgy, clergy and parishioners performed a procession around the church with the Tikhvin Icon. Metropolitan Hilarion with Fr. Serge ascended on a cherry-picker and blessed a newly erected cross on the façade of the church. The cross was constructed by cathedral parishioner Yury Steblak, and the cherry-picker used in order to bless the cross was arranged by parishioner Vitaliy Konofolsky. Returning to the church, Metropolitan Hilarion congratulated the clergy and parishioners with the patronal feast day and addressed them with a sermon, in which he talked about the history of the revered icon. "A legend exists, that the Tikhvin Icon was painted by Holy Evangelist Luke but, perhaps over time, other iconographers renewed the icon. The history of this holy image is so rich, that one can single out several stages in its life. Originally, the icon was in Jerusalem, and in the 5th century it was moved to the capital of the Byzantine Empire – the city of Constantinople. In the 10th century, the Turks besieged the city, bringing much anguish to Orthodox Christians for many years. According to legend, the icon was then in the Church of Blachernæ, disappeared and found itself in Russia, in the area of ​​Lake Ladoga. Since then, she stayed there, and with the prayers before this icon, many miracles were revealed. "During the October Revolution, the Tikhvin Icon was saved and during the Second World War, it ended up in Latvia, where it was brought by Archbishop John (Garklavs). And from there she was brought to America, where she stayed for 60 years – in Chicago, and where many could venerate the icon. 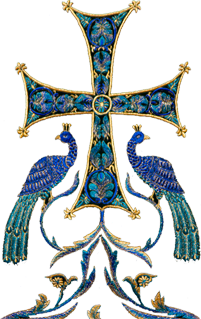 Archbishop John left a testament – to return the icon to Russia, when the Tikhvin Monastery would be restored. And in 2004, the holy icon was solemnly returned to Russia, to the Tikhvin Monastery. Great joy was with people when the icon returned. So the Mother of God found the place of her permanent residence where She remains to this day." Metropolitan Hilarion called for the believers to pray to our great intercessor – the Most Holy Theotokos, to be worthy of her prayers and intercessions before her Son. 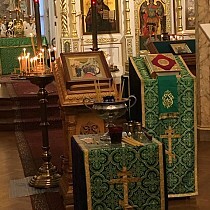 Later, Metropolitan Hilarion, the clergy and faithful went to the grave of the ever-memorable Protopresbyter Valery Lukianov, where a litia was served for the longtime rector, as well as for Subdeacon Anthony Beliaeff, who served for many years as the parish‘s warden and reposed ten years ago – on July 9, 2008. A lenten repast was held in the parish hall, where interaction continued between the clergy and parishioners.